I'm not joking. GM just announced they're stopping production of 6 Sedans. Ford has done something similar. 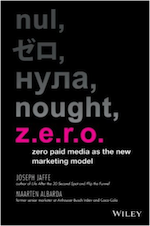 In this episode of Jaffe Juice - the New Marketing Podcast, I discuss. There's also a dual winner and loser this week as I riff (or rant) on Wunderman Thompson - the convenient or inconvenient union between Wunderman and J. Walter Thompson (JWT). You can listen direct or download here and of course subscribe here. This week's show brought to you by Net Cohesion and Bhive Coworking.